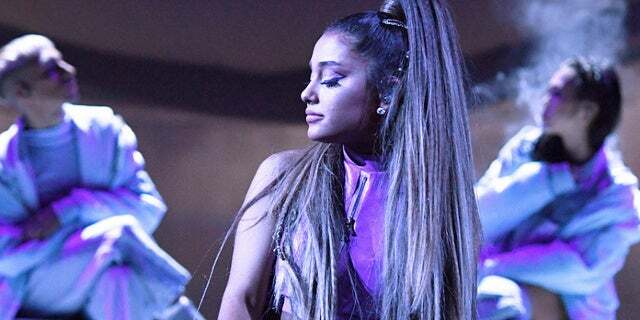 Ariana Grande fans are prepared to usher out the 2019 Coachella, dubbing it #Arichella according to the LA Times and attempting to outdo the performance Beyonce put on a few years back. But the pop star also seems to be teasing her own special surprises that might give fans of late '90s boy bands something to pay attention to. Chasez wrote on Twitter, soon retweeted by Grande who added, "Sure is..." followed by a giant black heart emoji. According to a report from TMZ , Lance Bass, Joey Fatone, Chris Kirkpatrick and JC Chasez are planning some sort of reunion on stage with Grande, but there is one obvious major piece missing. "I just am in absolute awe of you every night to see you up there in your glory, doing what you've been put on this Earth to do," Biel said in the video snapped backstage at the concert.